Hi Everyone. 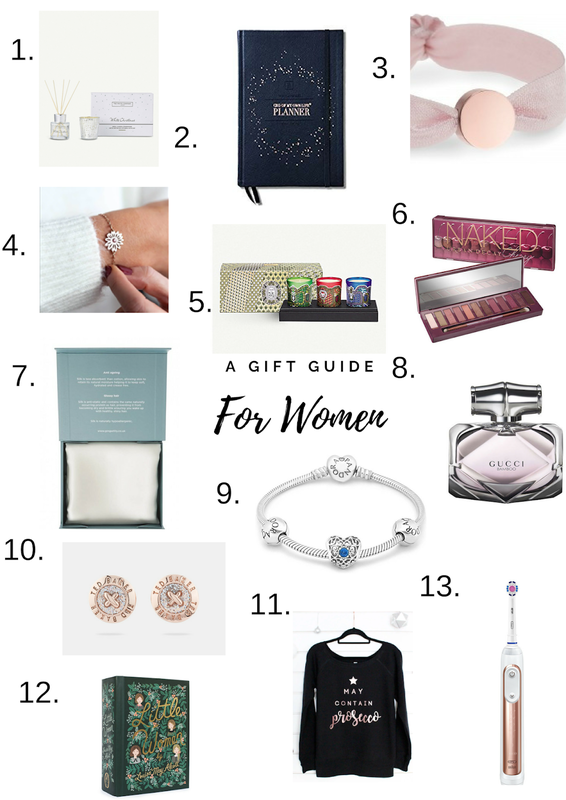 I am back today with another gift guide this time one specifically for the ladies in your life. I personally find women so much easier to shop for than men. So far all my Christmas shopping this year have been for my female friends and my female family members so it just made sense to post this today. I've come up with a few gift ideas for the lady in your life if you are still looking for some last minute Christmas gifts etc. Maybe something from the short list below will catch your eye. So there we have it, just a short list of gifts you might want to give this Christmas or if you're anything like me and have family who just do not know what to get you maybe this list will inspire you. I know the Oral B toothbrush has definitely caught my eye! I hope you've enjoyed this post and enjoy browsing through these gifts. Happy Shopping! What is on your Christmas list this year? One of my favorite things to do around London during the Christmas time is walk around London with my headphones in and a cup of hot chocolate (preferably from Costa) in my hand and just go on a long walk around the city having a look at all the Christmas decorations and lights. There's always something so magical about the city this time of year and London is a city that definitely knows how to Christmas. Today I thought I'd write up a short but sweet list of the top places to go to if you're in or around London this festive season. I'll also write how to get to each place by Tube as I feel like this is the quicker way to visit popular sites London however if you prefer walking I definitely recommend doing it this way as you'll see so many interesting things along the way and it's the perfect way to get to know the city as well as being a lot more cost effective. I was last in Oxford Street end of September, beginning of October and they had already started to put the Christmas lights on. I remember putting it on my instagram stories and getting a few messages from people asking when they switch them on. I believe they switched on the lights on the 8th November. I haven't been down to see them yet as I've been in Australia but on my next proper block of days off from work I'll definitely be heading down to see them and I can't wait. It is going to be so exciting. How To Get Here By Tube: Central Line To Oxford Circus. Easy access to both Oxford Street and Regents Street. If you know me, or follow me on instagram or twitter or have even read my blog in the past then you will know how obsessed I am with Covent Garden. It's one of my absolute favorite places in the city. I love how it always dresses up for each season and has street performers and Christmas is definitely no different. They always put a massive tree up each year which is always a popular attraction around Christmas and the market place is always dressed up. They always have street performers and interesting things going on within Covent Garden as well. It's a very lively place normally which livens up just that little bit more around Christmas. How To Get Here By Tube: Piccadilly Line Straight To Covent Garden OR Leicester Square. Covent Garden is only a 10 minute walk from Leicester Square and I definitely recommend getting off there for a bite to eat before walking to Covent Garden. 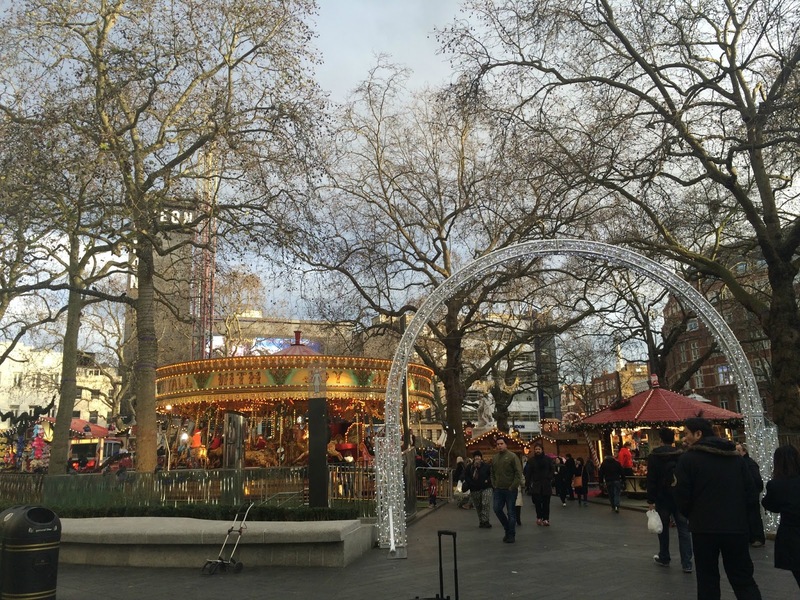 Leicester square is also a fab place for visiting at Christmas as they tend to have a mini German market in the square as well. Each year Somerset House puts up a huge ice rink until after the new year and it is definitely one of the most stunning spots in London over the festive season. I definitely recommend this place for Christmas days/nights out. If you're worried about not being able to ice skate I believe that they do have a bar there so you can head on in there for a drink as well as be a spectator on your friends and family. Whatever you choose to do I definitely recommend heading round to this location even if it is just to take a few snaps. It really is a beautiful location. How To Get Here: There are loads of ways to get to Somerset House. The quickest is to take the Circle or District line to Temple and it's about a 5 minute walk from there. However if you are going to Covent Garden then it is just an 8 minute walk to Somerset House from there so you can head to both locations in one day. Winter Wonderland is a huge Christmas Market with rides for all ages and a huge ice-rink located at Hyde Park. It's something that I go to every year without fail and a few years ago I even worked there for a season which as very enjoyable if not freezing. Even though it is free entry (winning) if you want food, drinks or even a go on some of the rides or ice skating it can be a bit pricey but I definitely think it's something worth going to. They have loads of Christmas market stalls there so perfect to pick up some unusual bits and bobs as Christmas presents. Winter Wonderland is the perfect location for those Winter date nights too. How To Get Here: Take The Piccadilly Line straight to Hyde Park Corner Station. However be warned this station does get extremely busy in the evenings and weekends. You can also take the Piccadilly Line OR the Jubilee Line to Green Park station where it is only a 10-15 minute walk to Hyde Park from there. I recommend this route as it's less crowded when people are going to Winter Wonderland. However they do tend to close Hyde Park station in the evenings so if you're planning an after work trip be warned that Green Park does get very busy as well. New Bond Street is a place I always visit at Christmas. They have some of the higher rated shops like Tiffany's, Victoria's Secret and Cartier. If you know London already then you will know all about how they dress this shop up at Christmas. It's the same in New York as well and is definitely a must visit for all those insta snaps. It's a beautiful location and one I head to each year to see how they have decorated the shops. It's also a perfect place if you fancy being a bit spendy and treating yourself or your loved one to a snazzy Christmas present. How To Get Here: Whilst checking out the lights on Oxford Street it's only a short work to New Bond Street from Oxford Circus (Central Line). You can also get the central line to Bond Street where it is only a short walk to the shops from there. If you're looking for some festive, instagram worthy, date night locations for over the festive season then I would definitely recommend these places. Now that I am back from Australia I am definitely going to be visiting these places and the excitement is definitely real. Be sure you're following me on instagram to see when I do visit these places. I hope you enjoyed this post and if you have been to any of the above places before be sure to let me know your thoughts in the comments below. 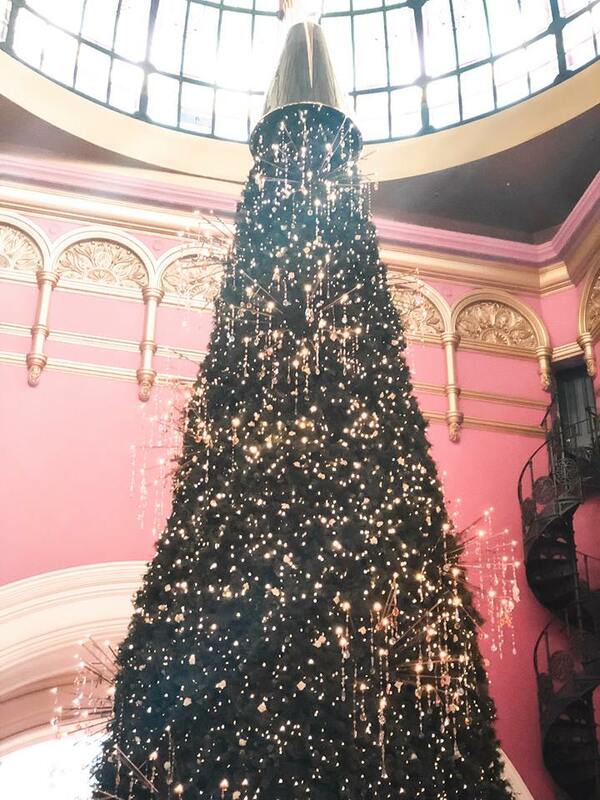 Where are your favorite festive locations in London or around the UK? Hey everyone! It's officially the first of December. Just how on earth did that happen. I won't bore you with how I can't believe how quickly the end of the year has come around because we will probably still be here this time next year and I don't think anyone wants that. To get back on track with what this post is all about Welcome To Blogmas 2018. Back at the beginning of November when it was a rainy day on my holiday to Sydney I started planning my Christmas posts. I know right? Eager beaver. I had made a few changes to my blog, whipped up a post and decided you know what? Better to be prepared now than wait until December comes around and struggle to get posts up throughout the month. We all know I've been the worst kind of blogger this month so each night of my holiday I decided to just plan some blog posts and start getting them set up. Christmas is my favorite time of the year and I remember two years ago when I did actually do Blogmas I thoroughly enjoyed it. I've manage to plan as many Christmas posts as humanely possible as that is the whole point of Blogmas however you might find I've thrown in a few random posts that aren't Christmas themed in for good measure so if you're fed up of seeing Christmas splashed all over your screen and want some different content, fear not as I have one or two posts thrown in there for good measure. As much as I love Christmas I understand that not everyone who reads my blog will celebrate it so there are some other posts there you might enjoy instead. I know that probably defeats the whole purpose of blogmas but I like to keep things interesting. I really have been on top of the ball with my blogmas posts and come up with a schedule and everything which is very unusual for me. Day 1 (today) will be a bit different as, as well as having an introduction to blogmas post I also have another proper blogmas post going up at around 1PM today. Tomorrow through to Christmas Day I will be publishing a post at 9AM every single day. Be sure to be following me here on Bloglovin' so that you never miss a post and here on Twitter where I will be posting the links to my posts multiple times throughout the day. I am really excited for Blogmas as it is something I've worked so hard on. 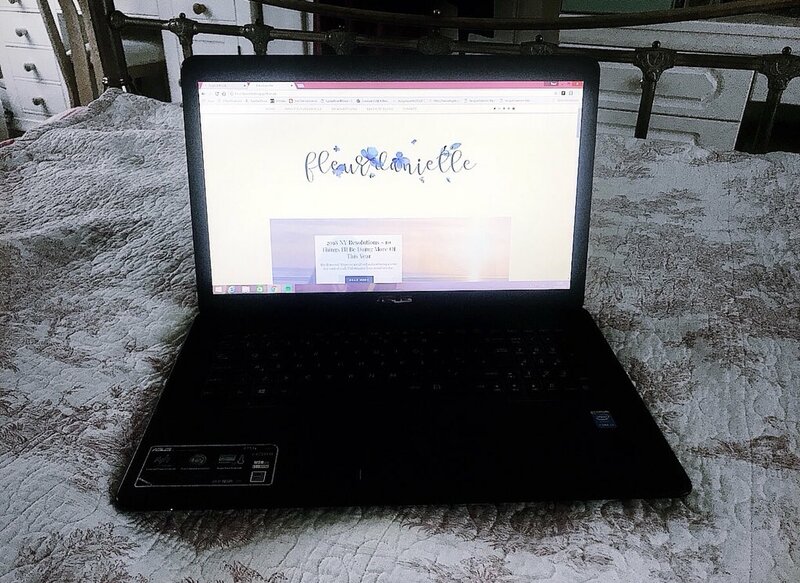 My blog in general is something I've worked really hard on for the past couple of months now so I hope you enjoy reading my blog and my future posts just as much as I have enjoyed creating them. On that note let the festivities begin. If you're doing blogmas/vlogmas or have any Christmas themed posts going up throughout the month be sure to tweet them to me or leave them in the link below as I'd love to read them. I'm now off to write some more Christmassy posts. Are there any Christmassy themed posts you would like to see? Hey Everyone! So I am currently in my room in Sydney about to start packing for my flight back home in a few days but lo and behold I haven't quite got the energy to start. My room is full of clothes, souvenirs, gifts etc that I am bring back home and I just don't know where to start. So naturally instead of making a list I open my laptop and start to write a blog post. That will definitley make me pack. Oops. Anyway, if you follow me on twitter then you will know yesterday I did a poll asking if I should publish my gift guide as part of blogmas OR now till the end of November. Lots of people suggested now until the end of November so here I am. I actually can't believe how close it is until Christmas. I know it's November but I've literally spent nearly 5 weeks in roughly 80 degree heat and it just doesn't feel like Christmas to me. I'm actually looking forward to getting back home to the dark evenings and cold weather with all the warm clothing and hot chocolate. I never thought I'd say that. 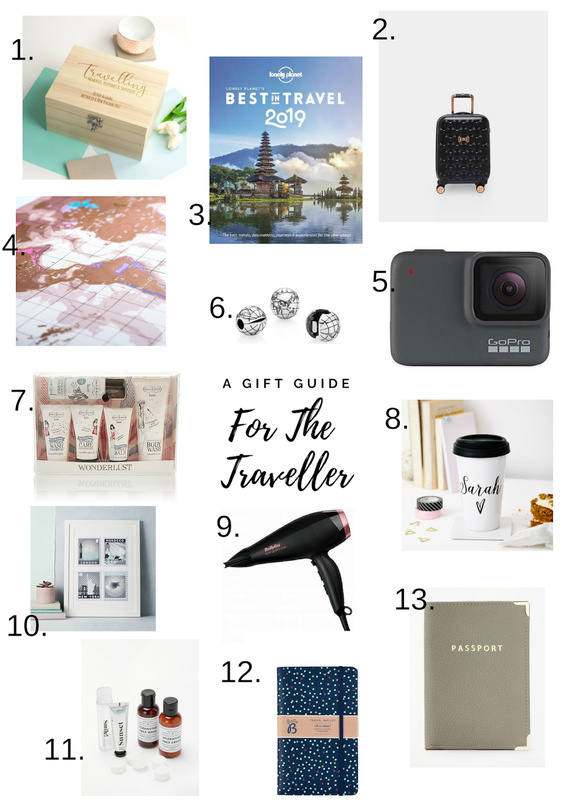 Anyway, today I thought that I would kick things off with a travel themed gift guide considering I am currently away travelling myself and I'm a major travel enthusiast in general. It just made sense to me to make this the first gift guide that I hit publish on. I've found some amazing gifts that will suit every traveler and I've tried to cater for all budget types. As I am still on holiday I'm not going to make this post super long so I'm not going to go into detail about each gift I've picked as they are pretty much self explanatory. I've provided direct links and prices to the products so you can head on over and check them out for yourself. If you know someone who loves travelling or you're a traveler yourself and have no idea what to ask for this Christmas then I hope this small gift guide helps. I can't think of any one who would disapprove of any of these gifts should they be travelling end of this year or next year. I've tried to cater for every budget so hopefully you'll be able to find something suitable for your loved ones. If you're not sure on any of these gifts each of these websites have their own travel section with other amazing gifts I'm sure they'll absolutely love. If you're a keen traveler yourself let me know below which of these gifts you'd love to unwrap on Christmas Day as I'd love to know. Have you got any travel plans this Christmas? Packing. One of my favorite things to do before going on holiday. I love getting everything ready and organised before a big trip away somewhere. However I do always panic that I am taking way too much or too little. For short haul flights I always find it easier. 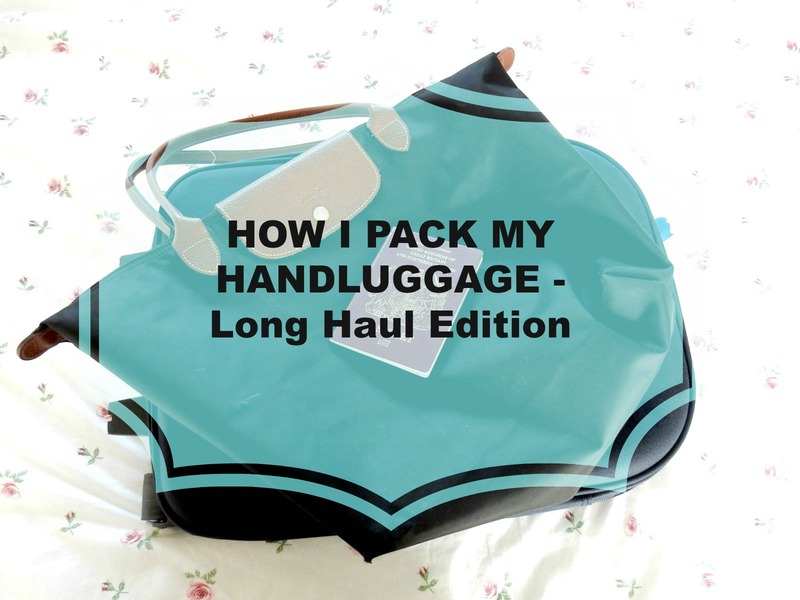 I know exactly what to take and normally only take one bag as it's just so much easier and how much do we actually dip in and out of our hand luggage anyway on short flights? However, when it comes to long flights it's different. You end up taking a lot more things with you and condensing things down to the bare essentials is something that I always struggle with. As you will know I am currently away in Sydney, Australia on a five week adventure. So far it has been amazing but very tiring. 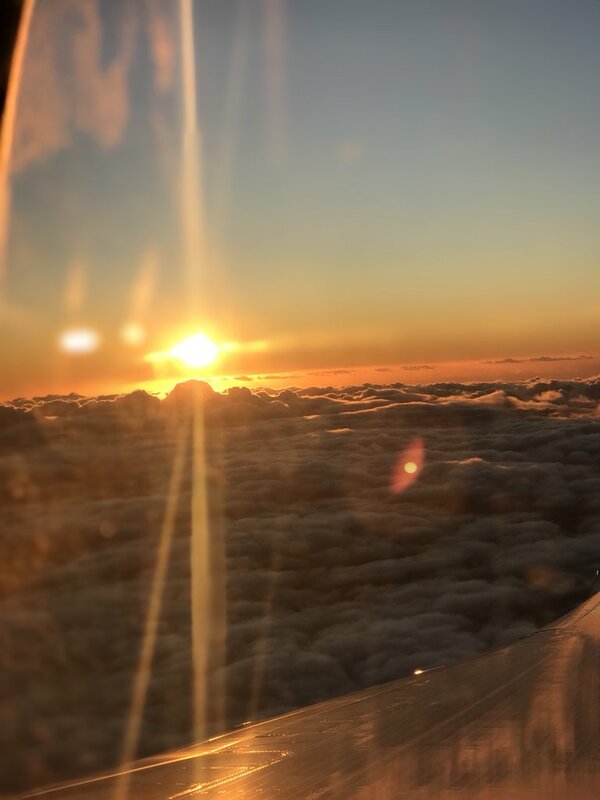 Today I thought why not just take it easy, relax and share with you what I always take with me on long haul flights and what I took with me on the plane over to Australia from London. I hope you enjoy this post. Passport & Boarding Pass: Passports and boarding cards are obviously needed pretty much anywhere you go in the airport. I don't think I need to say much more than this as if I divulge even further it's definitely what some people would call stating the flipping obvious. Portable Charger: I mean, I didn't really use this on the plane much as my phone was in airplane mode and I pretty much slept or watched movies on the flight over so wasn't on my phone. It was actually so liberating to not have to worry about work or replying to emails or checking social media every 5 seconds. I think I played one game on it and then ran out of lives so just went back to sleep but if you're on a plane that's lucky enough to have wifi and you need to do some work then a portable charger can definitely come in handy. In my case I wish I put this in my main hand luggage as my portable charger is quite bulky and definitely weighed down my bag. Purse - Obviously I keep this close by for all the duty free shopping and extra snacks for the flight. When I flew over from London I flew with Qantas and honestly found their service incredible. The food was amazing and they have a very pleasant habit of reappearing by your side with either another roll or fruit to tide you over until the next meal service and it's definitely something that's appreciated. Book - For times when I am bored and don't feel like having a sleep or watching a film. It can be quite difficult reading on long flights though because the people next to you may want to sleep and I always feel guilty disturbing them by putting on my light. I'm definitely going to infest in a little book light for my flights back home. Clear Bag Of Liquids - I managed to get some clear make up bags from Primark the day before I left London and it was definitely a great decision. I managed to fit all the liquids (besides make up because when you have a 20+ hour flight to get through I really don't care what I look like) that I'd use on the plane like handcream, eyecream, sanitiser etc. I just keep this in my handbag as it's so easy to just whip out at security as I know exactly where it is when I need it. In my main luggage I keep other bits and bobs I may need. I was really organised this year and made sure I knew exactly where it was when I needed them. I had pouches for everything and it just made it so much easier to pack things in and it was useful as I didn't over-pack. Pouch 1 - This pouch has all my chargers and cables inside for things like my laptops. cameras, iPads and my phone. I'm not one to use my laptop on the plane but I keep my chargers and everything in my hand luggage anyway just in case my main suitcase didn't make the flight. Luckily that wasn't the case thank god but it's still good to take precautions. Pouch 2 - In this pouch I keep the majority of my hair stuff. Things like hair bobbles/ties/bands/grips, my hairbrush etc. I also kept some earplugs in for the flight. These were mainly used for when we started to land. My ears pop really badly and the pain is sometimes unbearable due to the air in the cabin but these really helped and my ears were absolutely fine. It's definitely something I may go into more detail in another post but for now if you have any trips coming up soon I highly recommend investing in some earplugs. I also kept a couple of sheet face masks in here in case I felt my skin going groggy but as it was a night flight I just slept/ate. Pouch 3 - This was one the largest pouch and in here I kept sickness tablets as sometimes I can get motion sickness, tissues, cotton wool pads, face wipes just for a quick refresh during the flight, my jewellery (I'm never quite sure how to pack this so I kept a small jewellery box with me to store what I'll be wearing every day) ear buds and a small travel size hairbrush. I also keep other girl stuff here (I'm sure I don't need to say what it is - just in case). Pouch 4 - The smallest pouch of the lot and this has all my make up brushes inside. I kept them in a separate pouch to all my other stuff as I didn't really get time to clean my brushes before I left as I was working pretty much up until the day I left for Sydney so I just put them in a pouch and washed them when I arrived in Sydney. - Extra books. I am in Oz for five weeks and since I am a fast reader extra books are a must. - My laptop. I wouldn't be writing this blog post right now without it and it also has lots of movies and tv shows that I've downloaded to keep me entertained throughout this trip. - Headphones - I have three headphones all together. 2 overear headphones (one of which is wireless) and the smaller earphones that come with the iPhone as I find the bigger headphones can sometimes hurt your ears and you can't really sleep with these things over your head. Small ones are always a must for me as I can't really sleep when travelling without music playing. - Extra Underwear/Change Of Clothes - Just in-case I got to Oz and my suitcase didn't make it. This is so important I can't tell you. Always pack an extra change of clothes in your hand luggage people. You never know what could happen. - Scarf - My scarf is massive and can double up as a blanket when the flight gets really cold. I don't always like using the blankets provided on plans as I find they smell funny and are often quite itchy. I obviously won't be using my scarf in Sydney as it's extremely warm but I know when I land back in London at the end of November it is going to be freezing. - Journal/Travel Journal - I always keep a journal. It's something I've done since I was around ten years old and something that I always take away with me on trips. However this year I took an extra journal that one of my friends Beki got me for my birthday. I haven't got around to filling it in yet but I've already got loads of things saved to go into it and I can't wait to start filling it up. So there we have it, this is what I take in the cabin with me on long haul flights. Reading this post you're probably like woah that's too much stuff, surely you go out of your allowance but the truth is I actually don't. I was so organised this year and made sure that I didn't go above the weight allowance even though they didn't actually weigh my hand luggage. I find that it is definitely best to be safe than sorry. I even had a room to do a little duty free shopping as well which was a bonus. I am working on a PDF packing list which will be linked on my blog somewhere in the future so if you're a travel enthusiast like me and have a few trips coming up make sure to stay tuned to all social media where I am going to be linking this soon. How do you pack your hand luggage? Hey Everyone! Wow, long time no see/speak/interact (unless you follow me/I follow you on twitter or instagram. My last blog post was in March and so much has happened since then. I've visited three different countries. met and made so many new friends, moved up a tad at work and just generally changed as a person in quite a big way. I won't go into the nitty gritty of everything that has happened as we'd be here till this time next year but I was sitting scrolling through my photos earlier looking back through all the memories that I have made in the past 6 months and it made me realise how I've changed as a person. It hasn't all been fun and games though. Family members have fallen ill, work has been stressful, friendships have suffered but through it all I've still come out a better person. It's really inspired me to come back onto the blog and write about all the things that I've learnt about myself in my twenties so far. Enjoy. 1. I'm okay with being on my own. This is something that has taken me years to figure out. When I was younger I had to be surrounded by people and I would hate to be alone. Nowadays I'm happy on my own. I love just going out alone for walks alone with my headphones just listening to music, or just chilling in my room with a film on, or writing in my diary or catching up on blogs etc. I do like my own company and that's something I've never been ashamed of. 2. I'm not as nice as I used to be. I don't mean that I am a horrible nasty person, I just mean I don't take things as lightly as I used to. I stick up for myself a lot more and I do not let anyone walk over me as much as I used to. I've had a lot of comments from people who've known me for years telling me that I've changed when really all I've done is become tougher and stronger. I have no regrets. 3. I will never be a stay out all night clubbing kinda person. I just can't do it. Give me a cocktail bar where you can still have a bit of a dance and I'll be fine. Take me to a club and I'll just hide in a corner. They're too noisy, you can't hear yourself think in them, let alone the people you are with. Clubs are big no no for me. 4. I have a lot of down days and that is perfectly okay. I always get worried that I'm perceived as being too miserable but I've come to not really care when people thing. Everyone has stuff that they are going through. I tend to keep mine under wraps a lot but I still have days when I'm not my usual happy chipper self and to be honest I think that's okay. 5. Reading will always and forever be my favorite thing to do to de-stress. I get my love of reading from my Dad and my late Grandma. We all love to read and can spend hours with our heads buried in a good book and it's something that I've developed a deeper love for in recent years. I can't hit the high street without spending a good 30 minutes to an hour in a book shop. I just love them. 6. I am at my happiest when I'm out travelling exploring new places. I just love travelling. In the past few years I've been to Berlin, Amsterdam, Paris, New York, Shanghai and Mauritius and I am going to visit Australia next month for five weeks which I cannot wait for. Working in an airport has definitely opened a lot of doors when it comes to travel and it's definitely an opportunity I've been given that I have grabbed with both hands. 7. Writing in my diary is something that I'll always do for the rest of my life. I've kept a journal since I was 10 years old and every now and then it's still something I turn to when I need to rant or calm down. I thought being in my twenties now I am a lot busier and it's not something that I will have a lot of time for but I have definitely been proven wrong and it is something that I still turn to almost daily. I just absolutely love journaling and I know that it is something I'll always. 8. I will never ever be a heels person. Unless the heels are like 3 inches high forget it. I am the clumsiest person in the world and even manage to trip up and fall in trainers so yeah...heels are a big no - no. I also definitely didn't realise this when I fell FOUR yes FOUR times in one week, but I shall not go into that as I'll probably cry like I did the fourth time I fell over. 9. I absolutely love fruit and vegetables. Those of you who know me probably know me for being a chocolate addict and yes it does seem like I eat a lot of crap however when I'm home I'm the healthiest eater going. I eat so much fruit and vegetables and it's definitely something I've grown a love for in the last 3-4 years. 10. I am a very forgiving person. Too forgiving some might say and even though I might not react to certain situations with a pinch of salt anymore I still do forgive way to easily. Definitely something I need to work on but I have that 'hey everyone's human, we all make mistakes' kinda attitude. No matter how many times I try to freeze people out I end up forgiving them anyway. One thing I haven't yet realised is whether or not this is a good or bad thing. 11. I'm definitely more of a dress/skirt person than a jeans/top kinda person. When I was younger I would only wear dresses and skirts. Then I went through a jeans, jeans and nothing but the jeans phase. Now I'm slowly starting to convert back to dresses and skirts and I'm totally okay with that. I've already ordered about six new dresses this morning for my holiday to add to my growing collection in my wardrobe. Whoops. 12. To stop caring what everyone else thinks of me and just do me. This is definitely the biggest lesson I've learnt so far. Growing up in school I was constantly judged for the things I did, what I wore, what I looked like and it was just horrible. Now that I'm slowly but surely approaching my thirties I am starting to not give a flying you know what. Life is for living and it is way to short to not do something you want to do just because of how other people will perceive it. Go on that date, wear that piece of clothing, just do what you want. I promise you'll be a lot happier. I really enjoyed writing this post and even though still have a couple of years left till I'm out of my twenties completely I definitely thought this would be a good post to write and I'm hoping you feel the same way. Hey Everyone! Happy Sunday! Hope you have had a lovely relaxing weekend. I've literally been spending the day blogging, listening to Taylor Swift on repeat and just having a lovely chilled day. I'm on early shifts for the next four days as I'm mentoring work experience students which I really enjoy doing but I'm definitely dreading the 2:30/3:30 wake up alarm for the next week or so. I thought that today I would do a beauty post for you all. I haven't done a beauty post in a very long time so today I thought why not tell you about all the beauty and skincare products I absolutely adored throughout January. Before I start thought I thought I'd do a little disclaimer. Most of these items were gifted to me by family and friends as Christmas presents but all opinions are 100% my own. 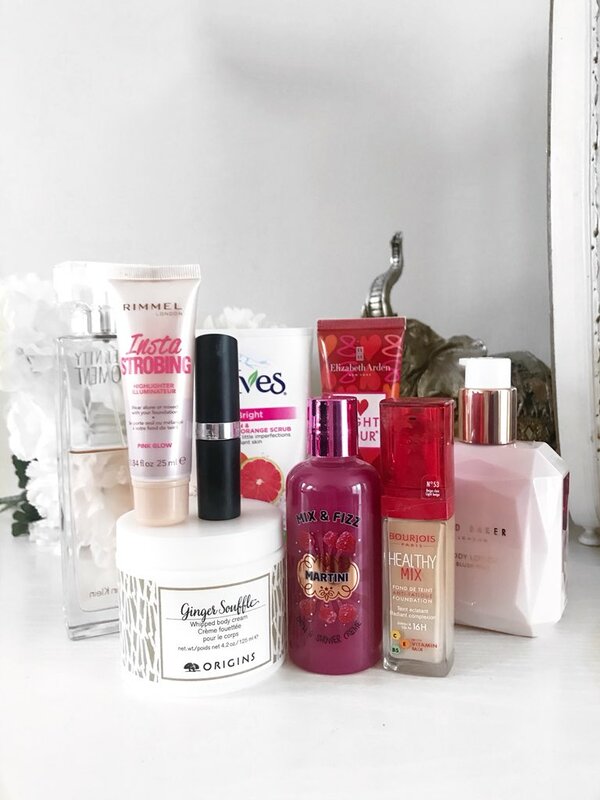 I feel like January is the time where everyone is testing out beauty products they were given at Christmastime anyway so I thought why not do a little post about my all my favorite products. Enjoy. Elizabeth Arden 8 Hour Cream: One of my absolute favorite products to use throughout January if not this past year has been this absolutely incredible cream from Elizabeth Arden. Highly coveted within the beauty community it is something that I couldn't resist getting my hands on. Despite not being a huge fan of the scent (difficult to describe but not very pleasant) the main product itself is amazing. It's just such a versatile, multi-use product. I can use it on my nails, eyebrows, cuticles, as a moisturizer, as a lip-balm and even a face mask. It's just an absolutely incredible product and definitely one that every girl should have in their collection. Rimmel London Insta-Strobing Highlighter: Okay, so before I received this product from the lovely Em Sheldon for Christmas I had never ever wore highlighter before. Don't ask me why it just wasn't a product I ever felt the need to use but I absolutely love this product and have been using it non-stop throughout January. When it comes to applying this product, I prefer to mix it in together with my foundation to give an all over glow. I'm all about that fresh glowy look with my make up and I find this really helps me get that perfect look. Definitely a product I highly recommend. Bourjois Healthy Mix Foundation: It's no big secret that I'm a huge fan of the Bourjois Healthy Mix Foundation. I've currently got about 5 in my make up collection on my dressing table. I just absolutely love them however I did go through a stage of experimenting with other foundations and brands. In January however I bought this foundation and I absolutely fell in love all over again. I wear the shade 53 which is the perfect match for me and I just find it gives me such a fresh glowy look. It's one of those foundations that combats any tiredness and really does an amazing job of covering my dark circles. It is quite a buildable foundation but I prefer to wear it as medium coverage as I don't like heavy on my skin but it's definitely one I'd highly recommend if you like the glowy dewy look to your skin. Rimmel's 'Berry Misschief' Lipstick: Another gorgeous gift I received from the lovely Em (Emtalks) for Christmas. I'm absolutely obsessed with this lipstick. Rimmel lipsticks have become a staple in my make up collection this past year and this was one of the few rimmel lipsticks I had never tried before and I absolutely love it. It's a gorgeous berry shade and as I have to wear red for lipstick this has been a firm staple in my make up bag. It's a gorgeous dark berry shade which I love as I always find that deep red shades always look the best on me and I find the formula of this lipstick is really long lasting which is perfect and what I need for long shifts at work. Definitely a new favorite of mine and one I'll be purchasing myself when this one has finished. St Ives Pink Lemon & Mandarin Orange Scrub: Scrubs seem to be a thing of the past in the beauty world at the moment. I never ever see anything about them at all and its definitely a product I haven't used myself in ages. However I noticed that my mum bought this scrub and keeps it in the shower. I spotted it in there about half way through January and started to use it on my face and I have been obsessed every since. Not only does it smell absolutely incredible but it leaves your skin feeling super soft and looking squeaky clean and fresh which I love. I find that my skin looks a lot brighter and healthier as well which I absolutely love. I use this every morning and night and I have noticed such a difference in my skin. It's definitely a product I'm going to be purchasing myself in the future. Calvin Klein 'Eternity Moment' Perfume: I received this perfume from my Aunt for Christmas and I absolutely love it. When it comes to beauty products skincare and perfumes tend to be two things I am absolutely obsessed with. This perfume is more of a floral scent which I'm normally not to keen on but I absolutely love this. It contains notes of lychee, chinese pink peony, musk and passionfruit amongst others and it's so gorgeous. It is one of those perfumes that can be worn either during the day or in the evening as it's not to overpowering for every day wear but strong enough to last all event as well. Definitely a perfume I'd recommend to everyone. Origins 'Ginger Souffle' Whipped Body Cream: Origins is one of my favorite skincare brands - however due to fairly hefty price tag its one I tend to not really go near often which is a shame as their products are so amazing. 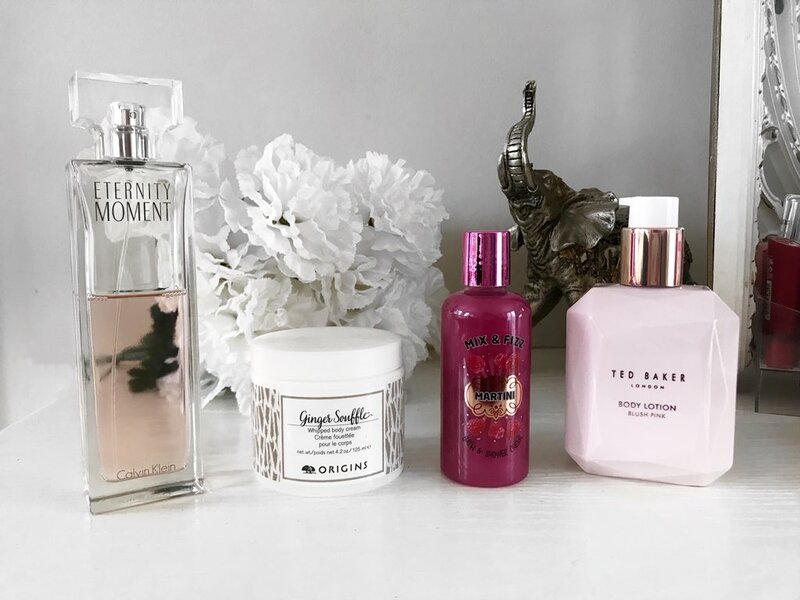 Em sent me a gorgeous selection of their products consisting of a perfume, a shower gel and my favorite from the selection which was the body cream. Not only does it smell amazing but it just leaves your skin feeling incredible. Unlike most body creams that take a while to sink in and leave you feeling sticky and gross this one is the complete opposite. I find that a little goes a long way and absorbs into the skin super quickly and the scent is definitely one that lingers for a long time. I've got a full review about this collection coming up so be sure to stay tuned. Mix & Fizz 'Martini' Shower Gel: For Christmas my cousins got me a cocktail shower gel set from Superdrug which I absolutely love. I am obsessed with cute shower gels that have a sweeter scent. My family all hate them but I think they are so cute and the scent always lingers on the skin for a long time I find. The Mix & Fizz brand always do lots of cute bath and shower gel things so I was super happy to receive this little gift set. The set comes with 6 different shower gels all named after different cocktails like Pina Colada, Mojitos etc but my favorite out of the set is definitely Martini as it smells absolutely divine. I do believe these shower gels come in full size bottles as well so make sure you check them out the next time you're in superdrug. Ted Baker 'Blush Pink' Body Lotion: I got a couple of ted baker beauty bits for Christmas as well and one of my absolute favorite products was the 'Blush Pink' body lotion. First of all the packaging is just so cute and looks so pretty on my dressing table. It also has a pump which is a godsend for beauty products as it means you don't go to overboard with product and it smells absolutely incredible as well. It does take a little bit longer to absorb into the skin but it's still an amazing product that leaves your skin feeling moisturized and smelling amazing. 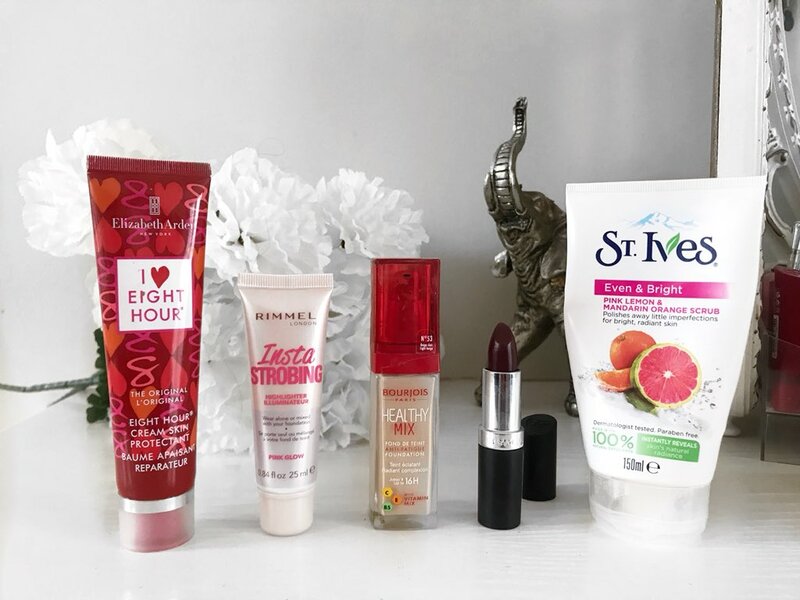 So there are my top beauty products that I used throughout January. 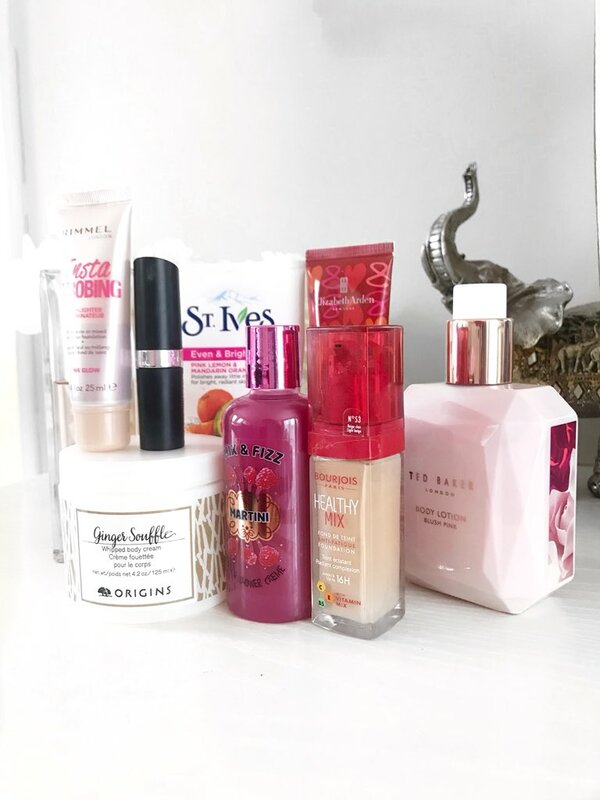 Like I've mentioned at the beginning of this post a lot of these products were gifted to my by family and friends but I absolutely adore all these products. They are all absolutely amazing. Posts like these are always some of my favorites to read and with pay day just gone maybe you'd like to treat yourself to some of these amazing products. If you have used any of these products in the past or throughout January make sure you leave me a comment below letting me know your thoughts as I love seeing other people's reviews whether they are good or bad. What were your favorite beauty products throughout January? Hey Everyone! Happy Monday! I hope that you have all had a wonderful day...and if not I hope it improves for you before the evening is up. Today I thought I'd take you through some of my top tips to help get you through the horrible winter season. The season where we are all struggling with colds and flus and are generally feeling cold, miserable and grumpy all the time. The weather this winter has been absolutely horrendous. It's so up and down to the point where you have no idea how to dress so end up either wearing too much or just not enough to keep you warm through the freezing cold days. 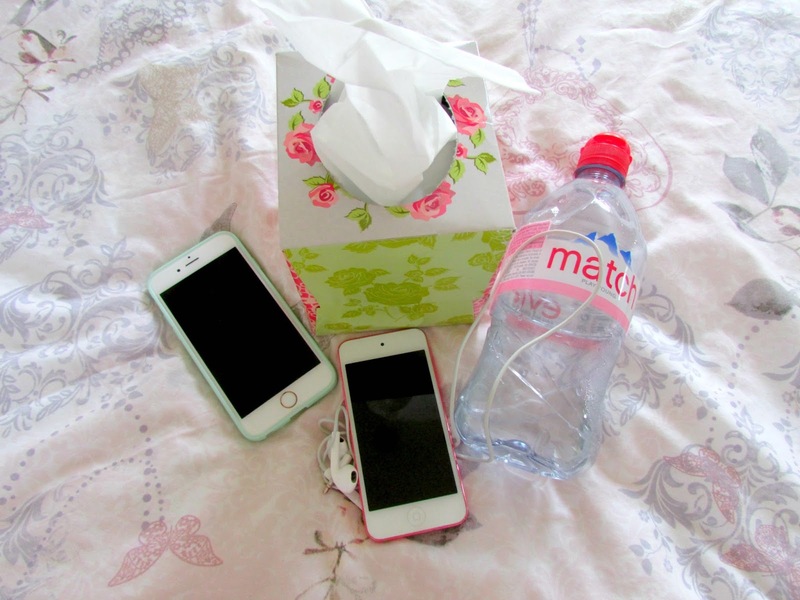 I feel like this winter has definitely been the worst of them all and I know lots of people, including myself, have caught a cold more than once this season so I thought I'd put together a little list of things that can help you getting through the dreaded flu season. Enjoy! No I don't mean a G&T. Have plenty of water to help. I always find that when I feel ill I always get dehydrated and my lips are super dry. Recently I've got into the habit of taking a bottle of water everywhere with me. When I go out, when I go to work, even when I go to sleep I make sure to have a bottle of water. Even if you don't really like water like me you'll be surprised how much better it makes you feel. Nothing says a sick day then spending the day in bed with your favorite TV shows or movies on Netflix. I've recently restarted to watch it on Netflix as one of my best friends has never seen it so we are watching it together and I'm really enjoying it because I never really watched the last few seasons properly and I've not actually watched the last episode yet...I mean...I know what happens thanks to good old twitter but anyway I'm going off topic here, netflix marathons are just amazing for when you are ill. There's nothing I love more than snuggling down in bed with the TV on when I'm ill. It's just so cosy. When I'm ill I absolutely hate going outside if I don't need to. I much prefer just staying in bed with netflix, lemsip and just relaxing however fresh air is so important if you want to recover. I always find going for a walk around the block or even grabbing a coffee or hot chocolate from costa just up the road does help me feel a little better because I'm up and walking around and taking in the fresh air instead of just sitting home feeling sorry for myself. 2017 was the year I fell so ill on numerous occasions. I ended up with horrendous headaches and I just felt awful. I did 25, 18 hour shifts throughout 2017 and a ton of overtime. I spent more time at the airport (I work for BA if you didn't know) than I did in my own house. It's not healthy and it's not good. I was always about the fact I needed extra money and overtime but money isn't everything and your health has got to come first. It's one thing I've promised myself this year that unless I am 100% desperate I am not going to be doing any overtime or crazy 18 hour shifts as it's just not healthy. I did no 18 hour shifts throughout January and I have already noticed such a difference in my health. I am eating better and I just feel healthier. I also haven't been ill once which is a bonus. I am extremely difficult when it comes to being ill because I very rarely drink hot drinks. I'm not a big tea/coffee fan so when I'm cold or ill I always struggle however my mum always makes me a really milky tea when I am ill and it's amazing - it is more milk than tea but there's just something so special when she makes it, I still don't know what the secret ingredient is. I also love drinking hot lemon and honey or warm milk with honey as I just find these drinks really warm you up and really help soothe the throat if it is sore. Definitely a few drinks I'd highly recommend for when you're ill.
Now when you're ill I know probably the thing everyone tends to do is scroll through social media for all eternity however one thing I've realised is that it tends to make me feel a lot worse. I always find that I have really bad headaches when I use my phone too much (because of blogging I'm always on my phone) and it's something I've come to realise isn't good for you at all. Turning your phone off for a few hours is definitely something that can help de-stress you as well. So here are a few tips to help you if you're currently suffering with a cold or flu this season. This winter has been awful and according to my bed it is just going to keep on getting colder so make sure you get plenty of rest, drink and eat properly and just wrap up warm. Hopefully you'll feel better soon. I hope you have enjoyed this post and bring on Summer is all I say! Hey Everyone! Hope you are all well. So today has been a day where I have pretty much spent the whole day cleaning and tidying up my room. I'm not the messiest person in the world but I'm certainly not the tidiest by any means. 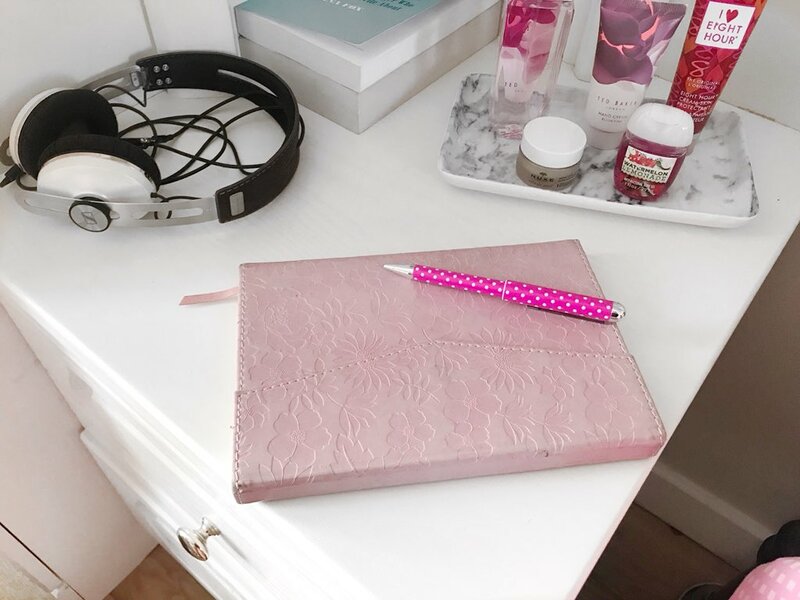 This blog post idea sort of came to me as I was sorting out and reorganizing my bedside table and I thought why not tell you some of the things that I keep on there. 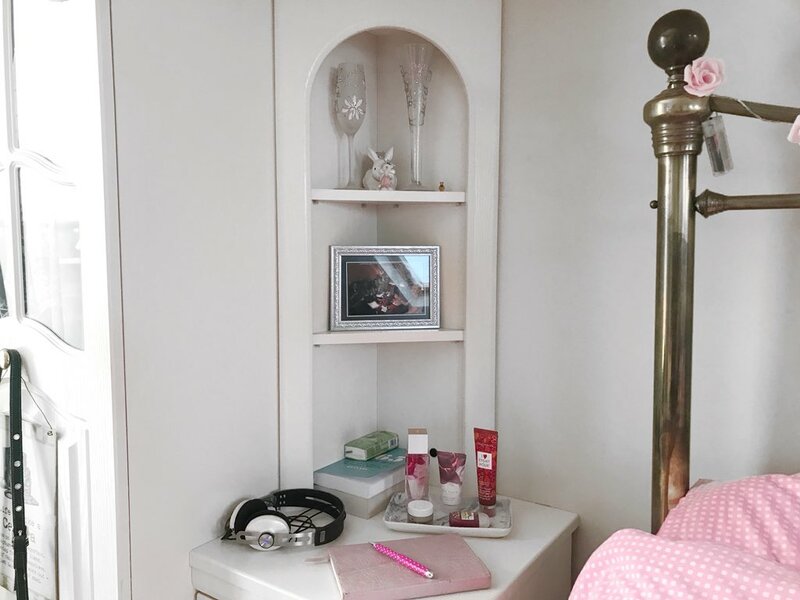 Bedside tables are not something I've considered very interesting before but in the past year or so I love seeing the different things that people keep there as I find out you can find a lot out about a person just by the things they keep on their bedside table. I keep a mixture of things on my bedside table so I thought why not share it with you. Enjoy. As you can see from the photo above my bedside table and in fact everything in my room (apart from my desk and couch) is built in. I have one bedside table on each side of my bed however I tend to use the one pictured (right side of my bed) more often than I do the other one. The other one is mainly full of books and magazines and I feel like the right hand side was more interesting so that's what I thought I'd share instead. The first shelf contains a couple of glasses that I received for my 21st birthday 7 years ago now. Since I got them I have kept them carefully on this shelf and in all honesty I am completely shocked they haven't yet broken. However they are both so special to me. 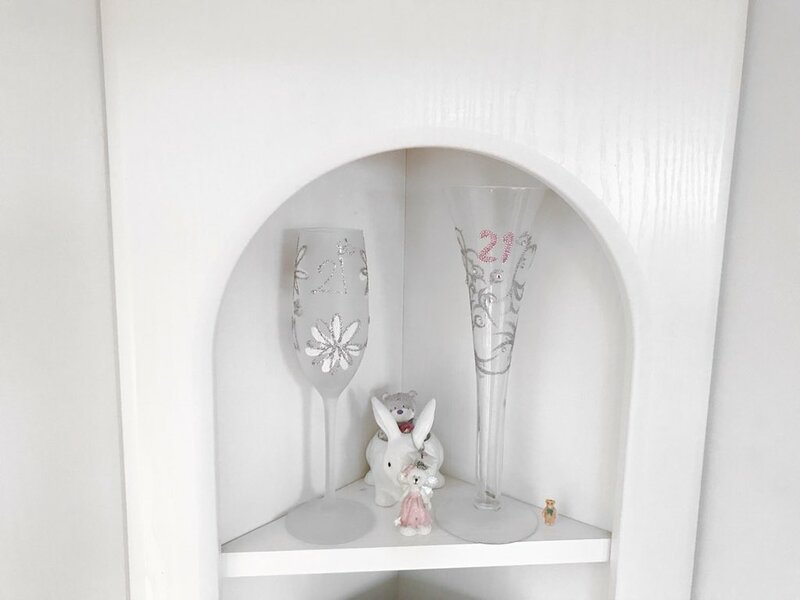 Both my Aunt's from Mauritius were here for my 21st birthday and it was the first time they had visited the UK and it was just so special having them here and they both bought me these glasses for my birthday so I keep them here as they are very special. I also have a little bunny candle holder that I bought but I keep it up on the shelf because I think it looks super cute. Inside it you will see a little teddy bear ornament inside it and this is a bear with the number 18 on which is something I received for my 18th birthday by one of my best friends at the time. Even though we've drifted apart over the years it's still something that's so special to me. In front of the bunny is a pink christmas decoration with the letter 'F' for my name that I keep there as I just think it's pretty. The next shelf is a shelf that tends to vary all the time. I keep different things here all the time. Sometimes I keep fake flowers in a vase on there or I keep a frame with the meaning of my name on here and I also have different word blocks that I keep on here that are all so special to me, however at the moment, as you can see, I have a photo with all my best friends from university on there. In the summer last year one of my best friends decided to make the decision to move back to Gibraltar which is where she is from. It was a big decision and one that wasn't taken lightly so we all arranged a special night out for her with food, drinks and it was one of the most amazing if not extremely emotional night. 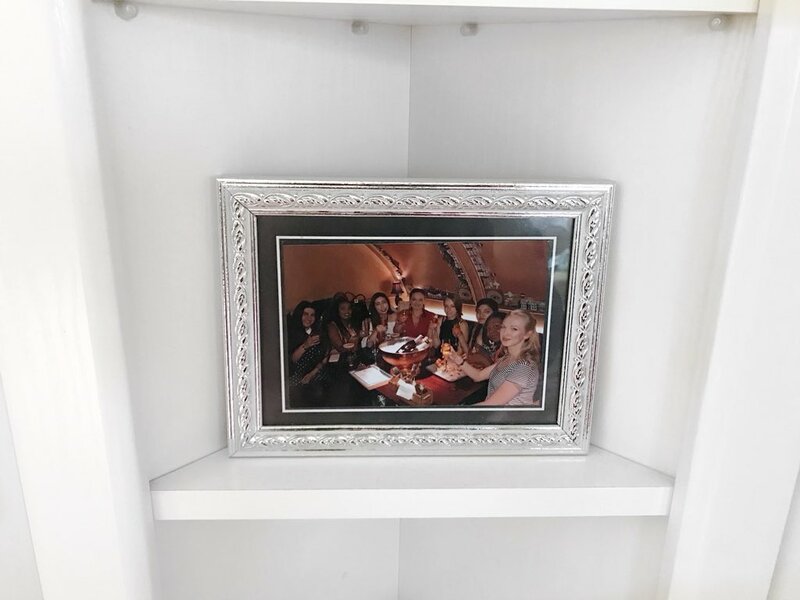 I decided to frame this photo as it was such a special night and makes me realise that I'm extremely lucky to have the friends I do! The main table is also something that tends to vary and not going to lie it isn't always as tidy and organised as it looks right now. At the moment on there I have a pair of headphones that I use to listen to music whilst I am blogging or watching netflix. I then have two books that I keep beside my bed. I keep '365 Blog Topic Ideas' by Dana Fox which is amazing if you're struggling for inspiration for blog posts, there's an idea on every page and it's just so amazing to flick through and then I keep the book that I am currently reading at the moment which is 'Two By Two' by Nicholas Sparks which is definitely a tear jerker. Would you expect anything less though? I also keep a packet of tissues here as I tend to have a very runny nose during the winter months. I then keep my journal beside my bed as well. I have kept a journal since I was around 9 or 10 years old. Even though it's not something I tend to do on a daily basis anymore I still write in there occasionally. There's just something so satisfying about putting pen to paper that I just absolutely love. I've got about 9 journals in my room and I love reading through them and looking back on the past years of my life. I think writing memories down good or bad is so important when it comes to the future and looking back on them. 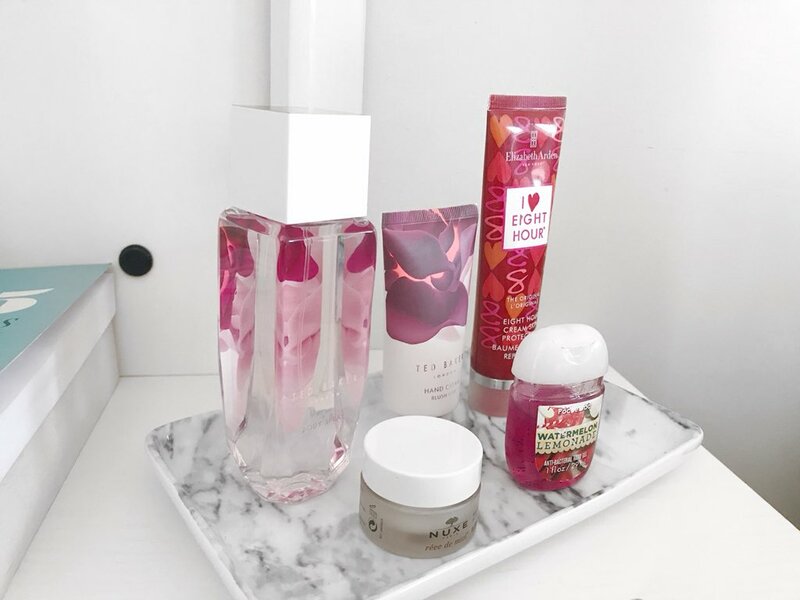 I also keep a few beauty bits beside my bedside table. I keep the products here that are quite an important part of my routine before I go to bed. I have a ted baker body spray that I keep here that I mainly once I have finished getting dressed. I keep it here because my wardrobe door contains a full length mirror inside it and it's where I do my final checks and final touches before I close it. I also keep a ted baker hand cream here which is amazing and something that I use every day when before I leave the house and every evening before I go to bed. Hand cream is definitely something that I need all year round but especially in winter as my hands just get ridiculously dry. The Elizabeth Arden Eight Hour Cream is also something that I keep on my bedside table and it's something that I use to moisturize my lips or sort out my cuticles in my nails and I just use it on any dry patches. This product is incredible and definitely something that has become a staple in my routine. It's definitely a product that every beauty lover needs in their collection. I also keep my Nuxe Rev De Miel lip-balm here for extra protection for my lips before bed. This isn't a product I use during the day but I use it before I go to bed as it has a really thick consistency that is a bonus for night time use as it sinks into the lips and moisturizes them extremely well while you're sleeping so in the morning I always wake up with super soft lips which is a bonus especially in Winter. I'm definitely not about that chapped lip life. Sometimes I'll also keep the Clarins Lip Oil here as well as that is amazing for dry lips but that is currently in my make up bag. I also keep a hand sanitizer here as well as I don't know why but it's something I have to use as soon as I wake up. I know that's a tad weird but I've always been like that. So there we have it. Probably the most random post you've read this year but I've actually really enjoying writing this for you. I loved taking the photos and editing them for this post and even though yes they are not the best photos you have ever seen in your life I like the way they look in this post. I hope you enjoyed reading it as much as I have enjoyed writing it. Let me know if you keep any of these things on your bedside table. 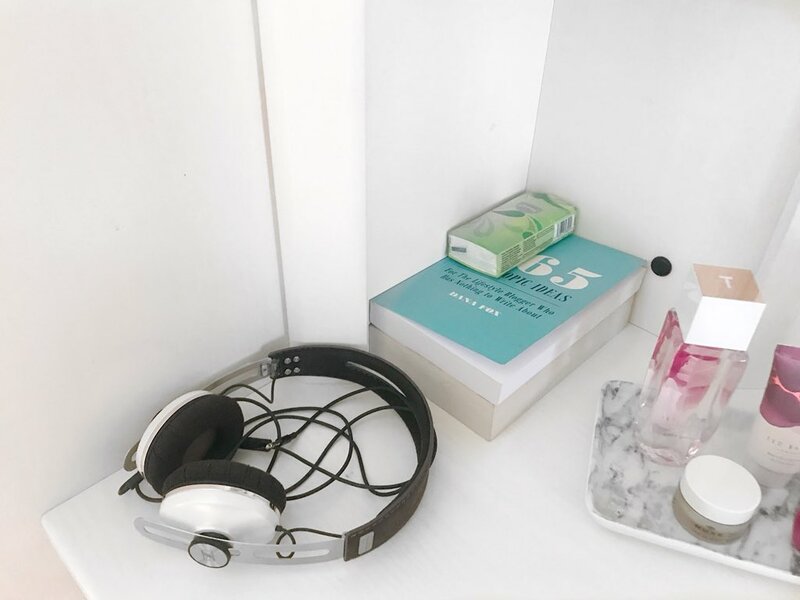 What are your favorite items to keep on your bedside table? 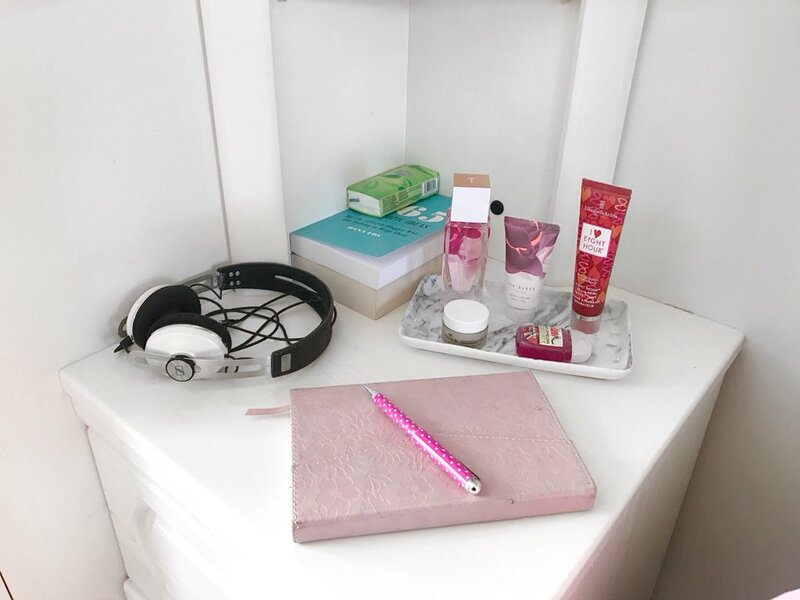 Bedside Beauty | What's On My Bedside Table? 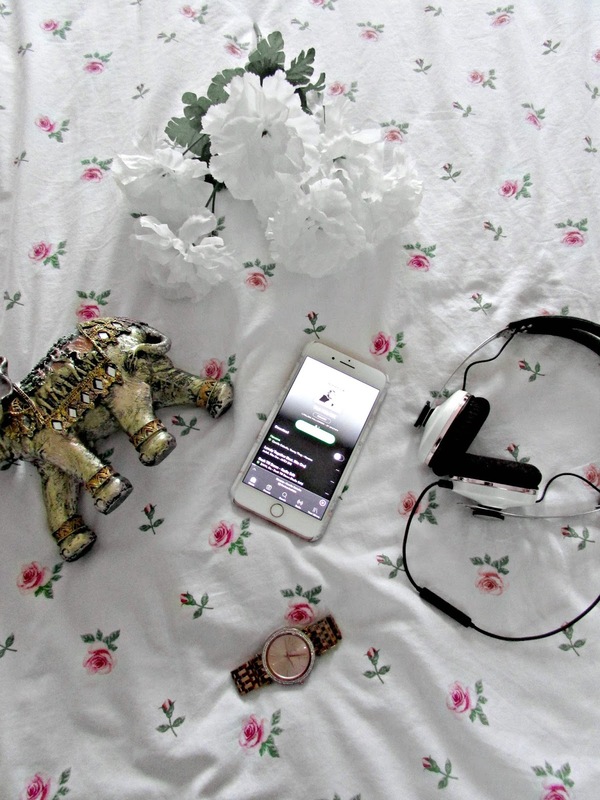 Whenever I am angry, sad, upset, happy, ecstatic, whatever the mood is I always end up turning to music. It really is the best thing to help put me in a good mood or just improve my mood in general. When I was younger the one thing I always used to turn to was music. I would just sit in my room, put my headphones or earphones in and just listen to music for hours. It was my way of escaping whatever was going on in my life at the time. We live in a generation where things tend to annoy us easily, where we get offended at the smallest of things and where certain people feel the need to bash, insult and criticize people for no reason and one of the things that, not just me, but a lot of people use is music to help us forget about all that negativity. With that being said I thought that today I would introduce some of my favorite spotify playlists that help put me in a better mood. Enjoy! As someone who loves to sing (even though I am extremely bad at it) I absolutely love that there's a playlist dedicated to all the songs we all know and love to sing along to. From Whitney Houston to The Killers...from Journey to The Spice Girls..all the songs we love to sing along to are in this playlist. Even though this playlist is named 'songs to sing in the shower' I think it's the perfect playlist to listen to when you're getting ready for a night out with your friends or when you're in the car on the way to work. This playlist is actually a playlist that I created myself when I was bored one day. If you know me then you'll know I am a huge lover of musical theatre and I also absolutely love Disney. One of my favorite things to do on my days off (when I can afford it of course) is head into London's West End and take in a musical theatre show...or just stay home and watch a lot of Disney films whilst singing along to the songs. Before Christmas I went to my friend Beki's house and we ended up watching High School Musical and singing along to it. Songs from musicals and Disney just always help put me in a better mood so I thought why not create an entire playlist with all my favorite musical theatre songs. I've recently added 'The Greatest Showman' soundtrack onto the playlist as it's just absolutely incredible and I am obsessed. If you haven't seen the film yet I highly recommend doing so. It'll absolutely blow you away. Definitely one of my favorite playlists on Spotify at the moment. It's one of those playlists that I just put on in the background whilst I am working or just chilling out. It's got a very chilled out vibe about it but the songs in the playlist are just amazing. The songs tend to be a lot slower and calmer but it's just one of those playlists that just helps to relax and destress you. I love it as I have discovered so many new amazing songs and artists from this playlist. Definitely one I recommend checking out. Like I've mentioned numerous times on my blog I absolutely love travelling. Back in August I went to France with my family and we always drive to Dover, catch the ferry across and then drive a few hours to wherever we are staying. I always find that this is the perfect time to either create new playlists or just browse the travel section playlists on spotify and one of my current favorites is definitely the ultimate road trip one. Not only does it have some absolutely amazing songs on it but it also contains some incredible artists, some of who I grew up listening to thanks to my Dad's amazing musical collection like Simon and Garfunkel. If you're a 90s kid like me then this playlist will absolutely make your day. I'm currently listening to it as I write this blog post and it is literally putting me in the best mood. I just cannot stop singing along to it. My brother is definitely not best pleased...oops. As someone who was a huge fan of Westlife, The Spice Girls, S Club 7 and even the Backstreet Boys this playlist is one that you have to listen to. It'll absolutely make your day. 50 songs of pure cheesiness. What more could you want?! So there we have it. Five of my favorite playlists right now that will definitely help improve your mood if you are having a rotten day. Music is definitely one of the only things that helps to make the world a better place. If you haven't got spotify I highly recommend downloading it. From creating your own playlists to being able to listen to playlists from others as well as playlists already created by spotify themselves there's bound to be something on there you love. Do you have spotify? If you create your own playlists be sure to let me know what they are below. I listen to all genres (apart from heavy metal). What are your favorite spotify playlists? Today as I sat down to write a post I was struggling to think of a topic. I called up my best friend and we ended up discussing what to do for her 30th birthday later this month. As we were planning things I couldn't help but think of things I want to do before I turn 30 years old. I already have a list as long as my arm but one thing I couldn't stop thinking about was travelling. If you have read my blog a lot the last few months then you will know that I absolutely love travelling and it's something I definitely want to do more of this year so I thought today why not write a post listing my top 5 destinations I wish to visit before I am 30. Grab a cuppa and enjoy! Abu Dhabi/Dubai - Two places that have been on my radar for a very, very long time. Despite both these places having an extremely hot climate they are both extremely young places and the architecture is just absolutely incredible. 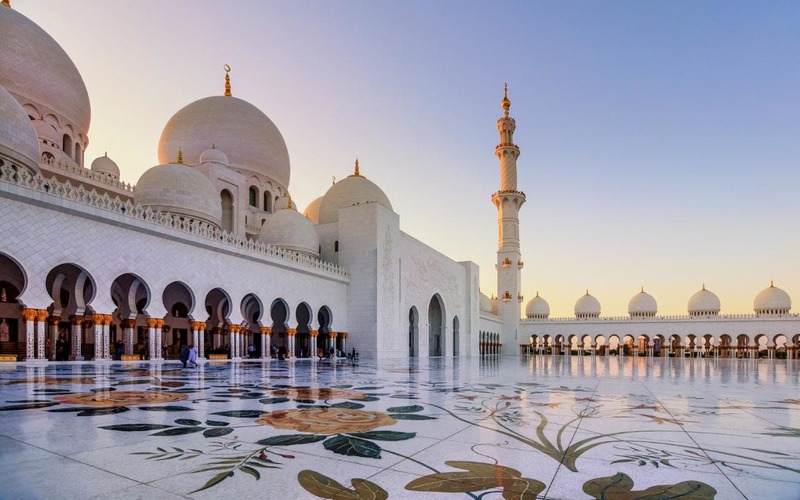 One place I am desperate to visit is the Sheikh Zayed Mosque. It just looks so beautiful. As someone who's always been extremely interested in other cultures and religions it's only right that I visit this stunning place. Both places just boast incredible architecture, beautiful beaches and other entertainment around which is very sophisticated. Lots of my colleagues and friends have been to Dubai and have given the place rave reviews so it's definitely a place I want to go hopefully in the future. Sydney - This place has been on my travel wishlist I'm pretty certain since I could walk. It's a place that I've always been drawn too. I love everything about it. I think the people are absolutely incredible, the accent is just amazing, and the city just looks absolutely incredible. 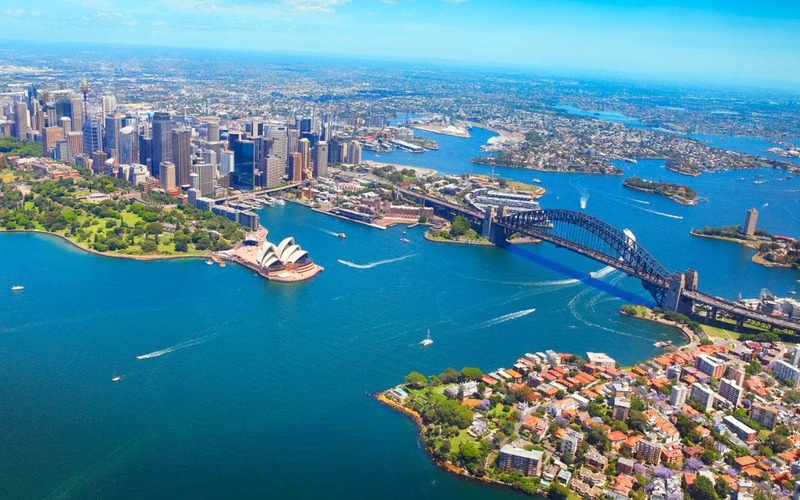 Sydney is a place my Dad lived for 4 years and growing up I've always heard amazing stories about his time there. I also have a step brother there who I've never met. My Dad and I are planning on heading over to Australia later on this year and I am ridiculously excited to finally being going after almost 27 years of hearing amazing things, not just from my Dad but fellow travel bloggers, friends and colleagues as well. Iceland - Again, Iceland is another place that has been on my radar for as long as I can remember. It just looks absolutely stunning. I long for the days when I can just experience life and go swimming in the blue lagoons over there. 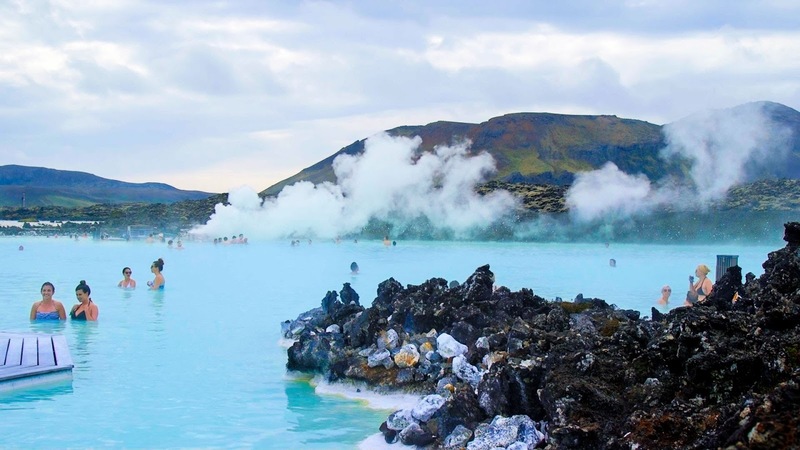 I've heard Iceland is a very relaxed place during the day with amazing shopping and food places as well as also having fabulous nightlife. What more could you want from a place. It just looks absolutely incredible. 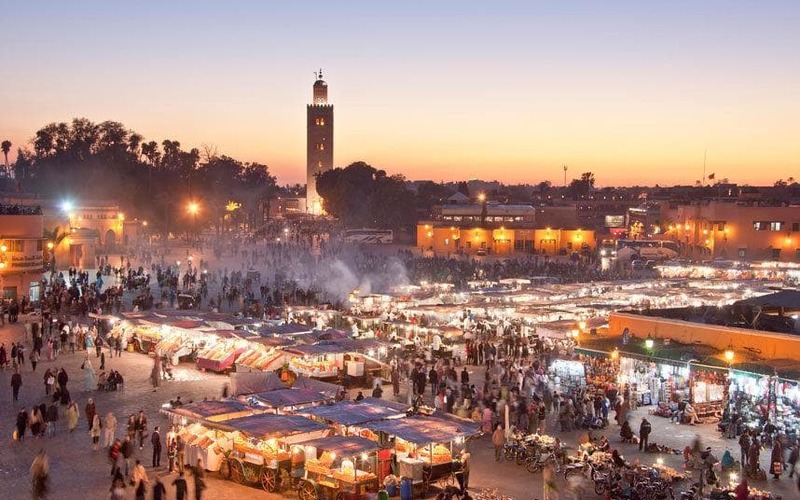 Marrakech - Morocco has always been a place I've wanted to visit mainly due to the food. If you know me then you know how much I love my food and I am always willing to try new cuisines and dishes and I've heard rave reviews about the food in Morocco. One thing I absolutely love about the city of Marrakech is how with every passing day it's changing and becoming a more modern city. It's a place where you have a mixture of new and old and I absolutely love that. It's a city full of so much variety and one that I definitely want to explore one day. 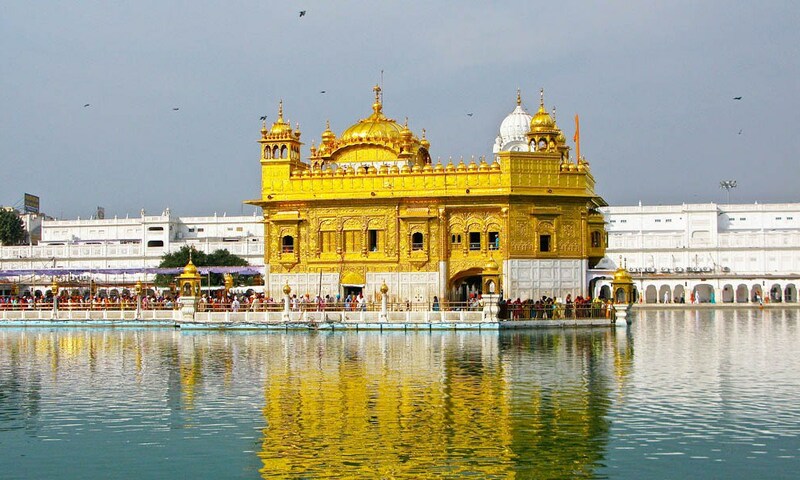 Amritsar - I've always been fascinated by India since I was young and one place I have always been desperate to visit has been The Golden Temple in Amritsar. It's one of those cities where you are definitely transported back in time. The city itself apparently contains one of the busiest markets in India. As someone who loves the hustle and bustle of busy markets this appeals to me greatly. Definitely a place I wish to visit in the next couple of years. So these are the top places that I want to visit before I am 30. I mean it's only a mere 3 years away now which is definitely a scary thought but I definitely need to start exploring more of the world. Writing this post has definitely made me want to start planning all these trips now but I definitely need to start with Australia as that is definitely a place I am going to visit later on this year. I hope you enjoyed this post and if you have visited any of these places in the past be sure to let me know your thoughts below. What top 5 destinations are on your list? Disclaimer: All Destination Images Found On Google Images - credit to the owner and creator of the photos. Main image of the sunset from the plane was taken by me on the way back from my holiday in Shanghai. 2017 was the year I came across some absolutely incredible people on the internet. It was the year that I definitely read more blogs, followed more instagram accounts and watched more youtube content compared to actually doing these things myself. Blogging wasn't something I took much pride in in 2017. It was something I found more of a chore than something I actually enjoyed. I felt uninspired and because I spent most of my time at work I was always tired and run down so I used to just ignore it and every-time I tried I felt like I was forcing it. 2018 will be the year I blog only when I am inspired and when I want to and I've gotta say that 2018 has definitely started with a bang over on my blog. I definitely have a bunch of lovely ladies to thank and so I thought why not share who my favorite bloggers, youtubers and instagrammers are at the moment. If you want some amazing new people to inspire you throughout 2018 then keep on reading! Sophie is a blogger that I've followed for ages but in 2017 followed her blog and instagram properly and I absolutely adore her, not only does she make even the dullest places look absolutely beautiful with her photography, but she is also one of the loveliest girls I've ever come across. Her content is always so honest and well thought out. She's one of those bloggers who writes like she's having a conversation with you. Nothing is forced it's all 100% honest and genuine and I just love that about her. She's also one of the prettiest girls ever. If you haven't checked her blog out yet then I highly recommend doing so by clicking the link HERE. Another blogger I've followed for ages. Elle is just a dream. She has such a fun, outgoing, bubbly personality. Her blog and instagram are just so full of color and life. She has one of the most amazing fashion senses I have ever come across online and her blog is always full of amazing outfit posts and she just has this really honest, lovely way of writing that attracts me to her blog every single day. Definitely one I recommend checking out HERE. Beth is a blogger I've always followed on instagram but who's blog I never really checked out until December time when the lovely Lydia Elise Millen mentioned Beth in her instagram stories. Since then I have followed all her content and her blog posts and I just absolutely adore her. She's one of the loveliest people ever and her blog is definitely one of my favorites to read as it's just so incredibly varied. Click HERE to head on over. I've followed Em's blog since I started blogging over 5 years ago now. It's one of those blogs that has inspired me daily. Em is one of the loveliest girls ever and her blog is so full of different content. If you want fitness, fashion or even a healthy food recipe you can find everything over on Emtalks. Towards the end of last year I was struggling with a few things at home and Em very kindly DM'd me and gave me advice and just made sure I was okay which meant the absolute world to me. She also very kindly sent me a little Christmas present as a thank you for supporting her so much over 2017...I mean I just couldn't have chosen a more incredible person to support. Head on over HERE to read her amazing blog. Jess is another blogger I've followed right from the start of my own blogging journey and I absolutely love her. Despite not being a fashion blogger myself I've always absolutely loved Jess' style tips and outfit posts. She's also a lovely person and throughout 2017 I've loved watching her travel adventures and have loved seeing her blog/instagam and youtube make over and I look forward to seeing what fabulous content she releases in 2018. I came across the lovely Jess' instagram account in the Summer last year and absolutely fell in love with her account. Not only do we work for the same airline (BA - she's crew though and I work on the ground) but she's inspired me to go to so many amazing places. 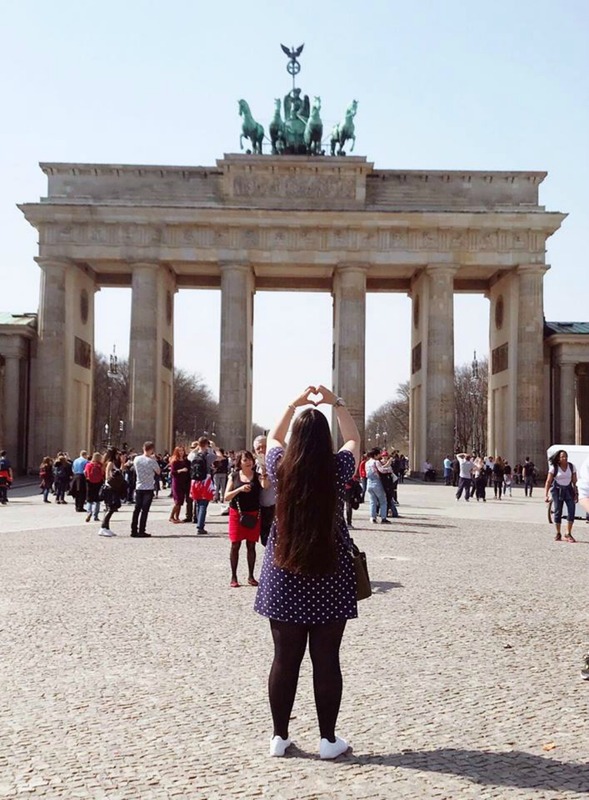 Jess is also a blogger and vlogger and writes about her adventures and layovers she has when she flies. She's definitely inspired me to become crew one day. We all know the job isn't easy and Jess doesn't shy away from that but she's always so happy and positive and is just a ray of sunshine on my instagram feed. I highly recommend checking out her instagram account HERE and like I said above she also has a blog where she talks about all the amazing places she has been on her adventures. You can check out her blog HERE. I absolutely adore Issy. I find her absolutely hilarious and she's definitely one of my favorite people on instagram. Her stories always make me giggle as she's just such a sarcastic person which I absolutely love as I'm really sarcastic too so I always end up crying with laughter at her stories. However Issy is also pretty fab at taking photos. Her feed is full of pretty little product shots or fabulous photos of her cats and I just absolutely adore her account. Issy is also pregnant at the moment and I'm absolutely loving seeing her bump updates. I'd highly recommend following Issy's instagram account HERE and also her blog HERE. Lauren is literally the queen of cosy nights in. She's an absolutely incredible baker and her feed is full of pretty little cupcakes that she's baked, hot chocolates that she's made and just generally all the food you could possibly need for a cosy night in. It's also such an incredibly colorful feed. Lauren is also an extremely lovely girl with a heart of gold. I highly recommend following her HERE but I take no responsibility for all your cravings afterwards! Lauren is also a blogger so make sure you follow her blog HERE. If I could describe Jordan in two words 'disney princess' is what comes to my mind. She is just so incredible beautiful and stunning and I absolutely love her instagram feed. It's full of all the travel inspiration, pretty locations, stunning outfits and absolute hair goals. Jordan's feed is definitely one of my absolute favorites. I've also been lucky enough to have spoken to her a few times and she's just so lovely. I highly recommend following her feed HERE and also her amazing blog HERE. Chloe's blog is a blog I've followed for a long time, and then I came across her instagram feed and it is just one of the prettiest instagram feeds I have ever seen. Her product shots are just amazing and her feed really is flatlay goals. I also love seeing posts about Chloe and her family as well as just product shots as she has the most beautiful little family. Definitely an account I recommend following so click the link HERE and also make sure to check out her amazing blog HERE as well. Scarlett is a blogger I've followed for a long time now and I've loved seeing how her blog and instagram have both evolved. It wasn't until the summer of 2017 that I realised she actually had her own youtube channel and I absolutely fell in love with her videos and ways of editing. She's such a lovely person and I look forward to following her youtube journey throughout 2018 as I know she has lots planned for her channel and blog this year. Make sure you're subscribed to her youtube channel HERE and that you're following her blog HERE and her instagram HERE. Freddy is one of the sweetest girls on youtube I've ever come across. Her content is always so amazing and I absolutely love her fashion sense. Despite following her for a long time I think 2017 was definitely the year her channel popped to me. Her content was always so incredible and she introduced us to her little sister Coco who is just the most adorable little girl ever and it's just so lovely to see that they have such a lovely relationship. Freddy has a lot of amazing content planned for 2018 and I personally cannot wait to see everything as her videos are always so lovely. Make sure you're subscribed to her channel HERE and her instagram HERE. Emma is a person I knew of because of made in chelsea. However what I didn't know was that she had her own blog which is amazing. I followed her blog for a good number of months and then Emma started up her own youtube channel which I absolutely love. Emma is very much an advocate of health and fitness and this really shows through her many videos of body confidence and healthy eating. Emma is a lovely person as well and her videos just radiate so much positivity that you can't help but smile when you watch them. I highly recommend subscribing to her channel HERE, following her blog HERE and following her instagram HERE. A new youtube favorite of mine this past year has been the gorgeous Lydia. I came across Lydia back towards the end of 2016 when she had just got engaged and was planning her wedding videos. Despite being very much single and not close to getting married at all I've loved watching her prepare for her wedding, especially when it comes to her skincare routine and going to try on wedding dresses, it was just so special to watch. Lydia has the most amazing fashion sense as well and is just a lovely gorgeous person. I look forward to following her journey throughout the rest of 2018. Be sure to check out her youtube channel HERE, her blog HERE, and of course her instagram HERE. So there we have it, my favorite online creators all in one neat package for you. If you're looking for any new bloggers, vloggers or influencers to follow throughout 2018 I highly recommend all these gorgeous ladies. They are all so lovely and will inspire you to no end. Be sure to let me know you thoughts if you already follow them below and if you don't make sure to click all the links to their various social media platforms. Who are you favorite online creators?